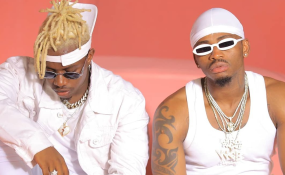 Tanzanian musicians Raymond Shaban aka Rayvanny and Nasib Abdul aka Diamond Platnumz have released a new song called "Tetema." The new release comes barely two weeks after they announced that they are working on some new music. The Tanzanian music regulatory authority BASATA recently lifted the ban that restricted them to release new music, not to perform their 'explicit' "Mwanza" song and restricted their performances in and out of Tanzania. This is not the first time that these two Bongo stars have come together to release a hit, they have previously collaborated on songs such as "Mwanza", "Iyena" and "Salome".